Way back when the Mets used to be good, an old friend and I would always lament these days games. It wasn’t just because we had to intermittently listen to the game on the radio, but it was also because odd things tend to happen to the Mets in weekday day games. I was reminded of that a few weeks ago with that bizarre game against the Padres. With the way Noah Syndergaard started the game, I was afraid of another one of those games. In the first he let up two solo homeruns. The Mets got him the lead in the bottom of the first, and he gave it away in the third. It looked like this was going to be a high scoring game, and Thor would be lucky to get through five. The Mets upheld their end of the bargain by scoring 12 runs. The Rockies wouldn’t score past the third for a 12-3 final. Amazingly, Thir finished with five strikeouts, 2 walks, four hits, and three earned runs in seven innings. Good for Terry Collins for sticking with him. This may not have been the game in which he had his most impressive stuff or control, but it might’ve been his most impressive game to date. It’s one thing to win when it’s all working. It’s another to have a rough start with less than your best stuff and still find a way. This is the type of game where you say he could join Jacob deGrom and Matt Harvey in being considered an ace. Offensively, the lefties were hitting on National Lefthanders’ Day. Curtis Granderson went 1-3 with a walk, two runs scored, and a three run homer. Daniel Murphy went 1-5 with a run scored and an RBI double. Kelly Johnson went 3-4 with a double, a home run, a run scored, and three RBIs. Michael Conforto went 2-3 with a walk and three runs scored. The only left not in on the action? Lucas Duda, who missed his third straight game with his back injury. It was also great to see Juan Lagares hit a pinch hit three run homer. He’s been going well pretty lately. It’ll be great to see him continue because the Mets could use his glove in the field everyday. On another note, you have to admit you feel great about this team right now. I’m sure there are fans still scared from 2007 and 2008, but this team isn’t that team. Plus, the Nationals aren’t the Phillies. The Mets swept the Rockies and made them look like a last place team. The Rockies beat the Nationals two out of three. I’m not guarantee in a division title, but I think it’s fine to feel confident and enjoy these games. Don’t let bad memories stop you from enjoying these new ones. Personally, I love how quietly Jacob deGrom and Matt Harvey are in this competition amongst themselves to be the ace of this staff. We shouldn’t be surprised the Mets have had two straight shut outs. Last night, Harvey allowed 4 hits and no walks with four strikeouts in eight innings. Tonight, deGrom was brilliant behind that brilliant fastball of his. He ended his last inning brilliantly with his 10th strikeout in the seventh. Overall, he allowed two hits with an uncharacteristic four walks. All the more remarkable, he didn’t allow a run with first and third with no out in the fifth (much of that due to poor Rockie base running). Offensively, Travis d’Arnaud is red hot going four for last nine. Michael Cuddyer played his second game in a row. He plated Juan Uribe, who had an RBI double of his own. We saw Yoenis Cespedes show a “Feat of Strength.” Other than that, there was much not going on offensively. This included a Michael Conforto pop-out in the seventh, when he pinch hit for deGrom. However, on a night with deGrom, three runs (3-0 final score) was all the Mets needed, especially with Tyler Clippard and Jeurys Familia locking down the win. I guess I should also mention Cespedes had quite the armband . . . 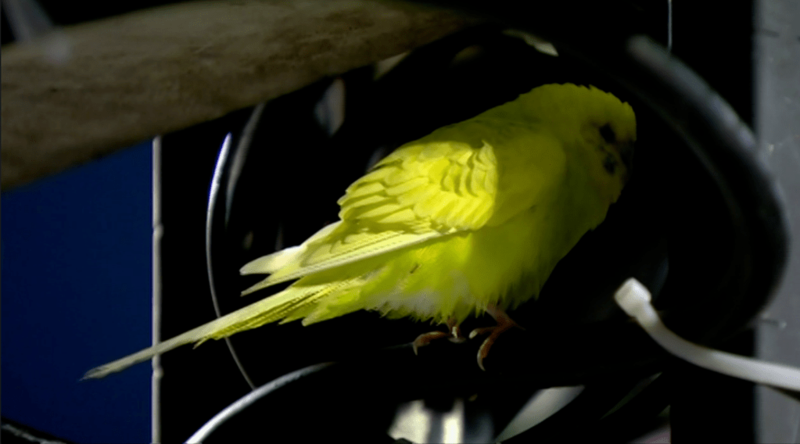 Whether it’s the black cat in 1969, or the yellow parakeet in 2015, I’ll take all the help we can get. Befote tonight, even though Mets starters have thrown more innings than any other team, and yet, have no complete games to show for it. So much for innings limits, huh? Tonight, Matt Harvey was yet again the real Matt Harvey. He could’ve gone for the complete game after having thrown only 97 pitches over eight innings. All night, there was only one hard hit ball against him. He had a 1-0 lead. He was lifted for Curtis Granderson. Granderson made Terry Collins looke good by drawing a bases loaded walk off of Boone Logan. Juan Lagares, who was seemingly stranded on base in every inning, followed Granderson with a two RBI double expanding the lead to 4-0. There were other highlights tonight other than Harvey. Lagares had a great game going 3-5 with two doubles and two RBIs. Michael Cuddyer‘s knee looked healthy scoring a run from second on Ruben Tejada‘s sixth inning RBI single. He also had an eighth inning stolen base. He also looked alright in the OF. There was some bad news. First, Lucas Duda missed the game with a stiff back. Second, Michael Conforto sat showing Collins’ is going to platoon him (exactly why he should’ve been sent down). On another note: over the years, Mets fans have been hard on Collins. Much of it was justified. However, he was never as bad as Walt Weiss has been these past two games. 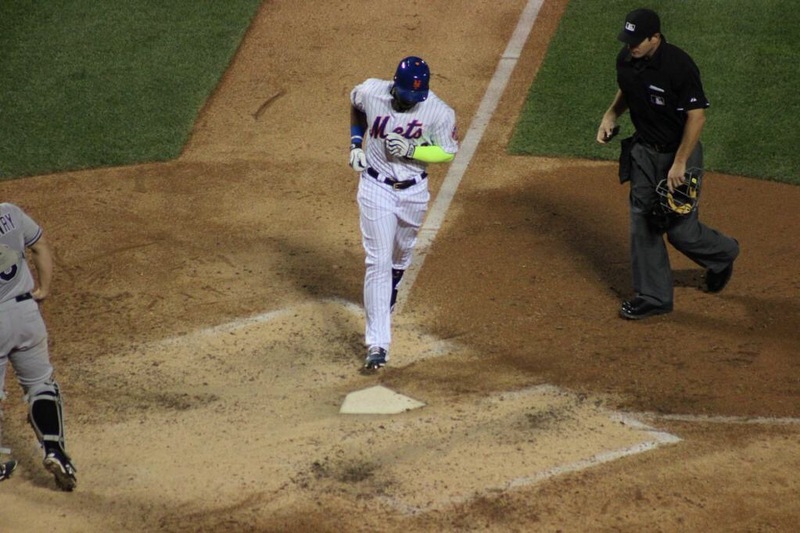 Earlier in the game, he ordered Tejada be intentionally walked to bring up Harvey. In the sixth, with the game getting tighter, he had Chris Rusin try to pitch around him. Tejada was wise to him and knocked the go-ahead run to the right side. Also, in two straight games, he got stuck with Logan against a RHB. It didn’t burn him last night, but it did burn him tonight. Anyway, tonight was about Harvey, who is still getting better. That’s scary. On a personal note, I’d like to thank him for capping off a wonderful birthday with a tremendous pitching performance and a win. This is season is becoming magical. In another year, this would’ve been a major let down loss . . . especially against the Marlins. I still have the scars from 2007 and 2008. This is a different team. The Mets came in rolling from the sweep of the Nationals and treated the Marlins’ arms like they were batting practice pitchers. Even Bartolo Colon got a hit. Michael Comforto hit his first major league homerun. Yoenis Cespedes hit three doubles that would’ve been homeruns in any ballpark other than the originally designed Citi Field. Everything was so great, the Mets didn’t even need a Lucas Duda homerun. The Marlins offense was so bad, they barely scored a run off Bartolo Colon. Overall, their offense was so bad the Mets got away with starting Wilmer Flores [insert obligatory standing ovation] without incident. Side note: can you imagine how unwatchable this game would’ve been had Sandy Alderson not made those trades? With the Nationals losing to the Diamondbacks, the Mets are in first place by themselves. I have a feeling that they’re pulling away from the Nationals. It’s incredible! It’s great! Did the Mets Just Duda That? On Friday at 3:00 P.M., things were about as bleak as it could be this season. The Carlos Gomez trade fell apart, and there seemed to be bickering as to whether it was due to Gomez’s hip or the Mets’ finances. On Thursday, the Mets’ bullpen inexplicably blew a six run lead. Then it seemed the Mets would add Jay Bruce until they didn’t. It sure looked like the Mets were never going to add a bat. Worst yet, the Nationals were coming into NY after previously taking 2/3 from the stud muffins. This was a Nationals team that went 15-4 against the Mets last year. On the eve of the trade deadline, the Mets acquired Yoenis Cespedes. The attention around the Mets changed from despair to hope. This hope continued to grow throughout the weekend. On Friday, it was a dominant Matt Harvey and an emotionally satisfying Wilmer Flores’ walk off homerun. On Saturday, it was the Lucas Duda Fireworks Show. Tonight, Thor was once again the story. Thor went eight innings with two two earned and nine strikeouts. Thor made the homerun barrage in the third to stand up. On back-to-back pitches, Curtis Granderson and Daniel Murphy homered. After Cespedes’ first hit as a Met, Duda capped off the five run inning with a homerun of his own. Tyler Clippard, in for Jeurys Familia (who pitched two days in a row), recorded his first save as a Mets. The Mets have flipped the script. They swept the Nationals and are now tied for first place in the NL East. I’m so excited that I’ll ignore they’re one behind in the loss column. The Mets are now 38-18 at home. Surprisingly, they’re 7-6 against the Nationals this season. The Mets are in a dead heat with the Nationaks and have six head-to-head match ups with them. They have an easy second half schedule. I can’t believe I’m saying this, but the Mets are in the driver’s seat in the NL East. We’ve waited seven years for this, and so far, it’s been worth the wait. Lets Go Mets!